It has been a long time since I fell asleep on the London Underground and fought the dreaded Tube Sanitiser for my life, only managing to escape due to the tiny fluffballs of fearlessness that are the London tube mice. 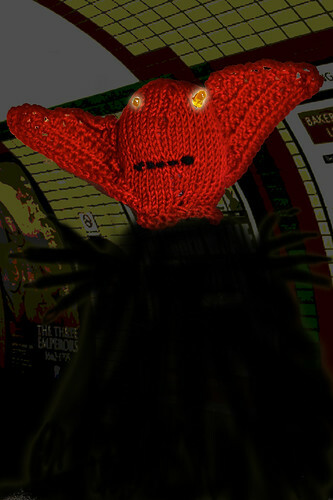 When I do return to the underground I keep my eyes open and my double-pointed needles nearby. I am well aware how wrong things could have gone down there had I lost my battle. Far below London where you can wander through the endless tunnels for eternity seeking an exit sign you never reach, pressing an ‘assistance’ button that spits back sinister static giggles, running wildly up an escalator that only ever descends, swimming through swathes of hollow-eyed commuters who stand in perpetual wrongness on the left, and surviving on discarded KFC bones and the dregs of cans of Special Brew you find in empty carriages. Each time I descend into London’s belly I prepare for a fight. Call me a paranoid purler. I call myself prepared. Lucky for this sneaky stitcher I was right to be watchful. The final tube home, I travelled under London and through midnight into All Hallow’s Eve on my work-weary way home. The carriage was empty save for me and the clicking of my needles as I knit knit knit. I was wide awake and wary. The soft surge of the Knitblast hung behind my eyes and at my fingertips. I felt its covert crackle and it reassured me. The train arrived at the station and the doors hissed open. I stepped onto the platform. Alone. As the doors slid shut and the tube train thundered away I froze. This was not the my station. It was barely a station at all. It was Aldwych – abandoned station of the terrifying Tubeline Trolls and I was standing on its platform with no way to escape but the yawning darkness of the tunnels behind me. A low chant began from the platform’s only exit door, a buzzing hum that echoed around the walls and surrounded me “Minnnnndagap! Minnnnndagap! Minnnnndagap!” it droned. I recognised it as their hunting cry. I readied my circular needles in either hand, the cord snapped tight, and turned towards the noise. And so they came. The terrifying Tubeline Trolls. The nefarious Northern Nasty with his glowing blood-red eyes that stare into your soul and pick out the tasty bits for later. The dastardly Districircle of Hell, a hulking green-yellow menace with a gaze that will turn your guts to cold custard and your gizzard to lumpy lime jelly. Vicmetrohammerscity – he has poky bits on his head. That can't be good. The vile and violent Vicmetrohammerscity, its antlers of atrocity glinting sharply in the gloom, ready to poke out your eyes and serve them in a cocktail like olives or those tiny pickled onions you only ever see at Christmas. The jeering Jubileevil, in the guise of a sickly swollen silver mouse he mocked the respectable rodents I owed my life to, like a bag of mouldy brie squelched into a mouse’s skin he oozed and oogled and squeaked and squelched. 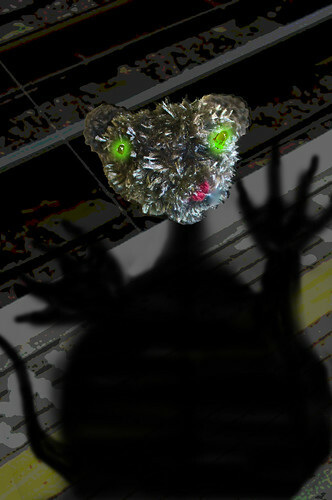 And lastly, sweating scariness and sorrow, stalked Centralzeebub, his yellow pinholes of eyes beams of damnation and dubious deeds as his gaze met mine across the cold platform concrete. The five Tubeline Trolls advanced and there was nowhere for me to go. I could smell their underground stench of commuter body odour and stale bits of takeaway dropped down the side of seat cushions. Centralzeebub cracked his red knuckles and led the advance. They shuffled towards me. “This commuter terminates…here.” he announced darkly as they advanced to the steady beat of Jubileevil’s unsettling giggle and the scrape of Vicmetrohammerscity’s antlers against the curved ceiling above. Then suddenly the distant thunder of an approaching tube train stirred the air, prompting the Tubeline Trolls to break into a horrifyingly fast rush towards me. Troll eyes in the dark. Erk! Not knowing what else to do I did what any sane London commuter has been warned not to do a thousands times over. As the train swept into the station I stepped across the yellow line, wilfully not minding the gap. Then I unrolled the centre-wind ball of yarn-venom in the Deadly Knitshade part of my soul and I hit the now-baying tribe with a Knitblast that knocked me clear off my feet, just as the beeeeeepbeeeeeeep heralded the carriage doors opening. I fell backwards into the train and landed with a thump on the carriage floor. 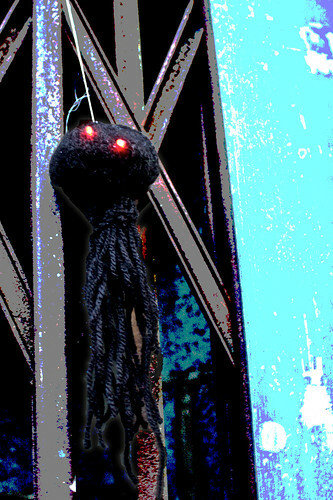 Outside the train the five horrors leapt for the closing doors spitting and swearing and covered in knitblast yarn. They were all claws and eyes and elbows, like rush-hour in the City but with less Blackberries and copies of the Financial Times. The doors drove shut as five bloated Troll bodies lunged for me and five rancid wriggling torsos were caught in the door. “I said STAND CLEAR OF THE DOORS!” huffed the invisible driver over the intercom. Oblivious to the fact that demon Trolls from beneath the city were scraping and squeezing to get into the train and eat my soul like a post-pub kebab. The beeeeeepbeeeeeeepbeeeeeep that signalled another attempt at door opening and closing sounded. In moments they would be free and I would be foodstuff. I leapt to my feet and threw myself towards the writhing woolly mass of Troll turmoil. With five swift strokes I pulled my circular needles garrotte-style around each Troll neck, avoiding snapping teeth and slicing claws, and one by one I lopped off their heads and stepped aside as they bounced to the carriage floor. Where's a tube sanitiser when you need one? Centralzeebub roared in troll-horror and exhaled a breath of ancient cigarette ends, rat droppings and Evening Standard ink as his head came away from his wriggling body, and the doors slid open and reclosed dropping five headless Troll bodies into the endless gap. I sat in the carriage covered in troll-blood. Five knitblasted troll heads rolled about me like yarn-covered grapefruits. I picked them up, placed them in my knitting bag and took them home. 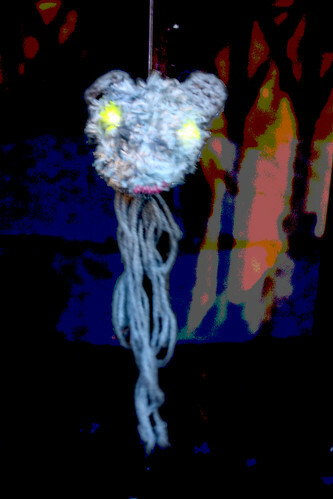 The next day, Halloween, I revisited the abandoned station entrance with my Knit the City fellow yarnstormers. 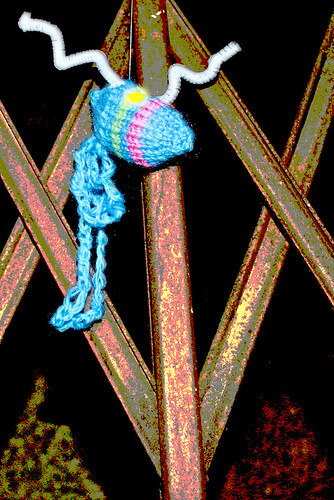 Together we yarnstormed a warning to the city. I hung the heads up as a wool-covered warning. Their eyes still shone. There are many more tube lines beneath the city and there is a Tubeline Troll for every one. 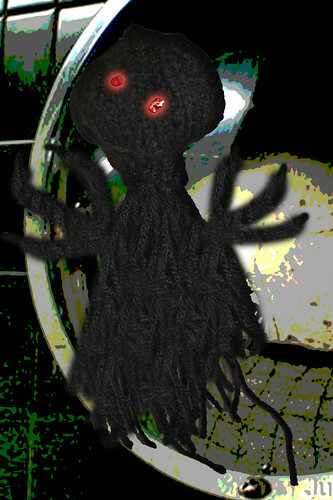 Under London there lurks an evil that only knitting can save you from. amazing, love them all! Thanks goodness I live in the countryside where there aren’t even any trains, let alone any underground. as usual your magical talent for words leaves me speechless, nice post lady! A truly terrifying tale! 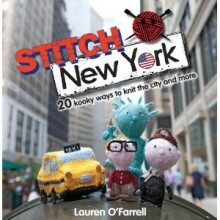 I won’t be sleeping tonight, but will be picking up the needles and learning to stitch for my life! I would love to see some of your knitting appear on my REAL wall – this is a great blog and I’ve just subscribed to it in my google reader. Who else is in the Graffiti Knitting Collective? All the links to my sneaky stitching crew are here in the links on the right. You’re welcome to drop us an email at yarncorps@knitthecity.com if you have any questions for your blog. wow, what a saga! I think I would have preferred bumping into the knit trolls than the football fans when I lived in Wembley , they vomited out of the station like a wild horde. I so enjoyed your yarn! and seeing your knitty adventures! I’d prefer the trolls to football fans too. At least they’re stylish! Why have I only just seen this comment?